Twitter is a popular social networking site, which creates a platform for users to read and send tweets. It is also a great place to source traffic to your website. Having a good fan base of twitter followers can lead to a successful blog which people visit regularly to see your updates. There are many different extensions for Chrome out there, all these are meant to increase convenience for the user. Twitter for instance, is one of the areas where extensions come in most handy. Some of these plugins can enhance your twitter experience especially if they are effective. 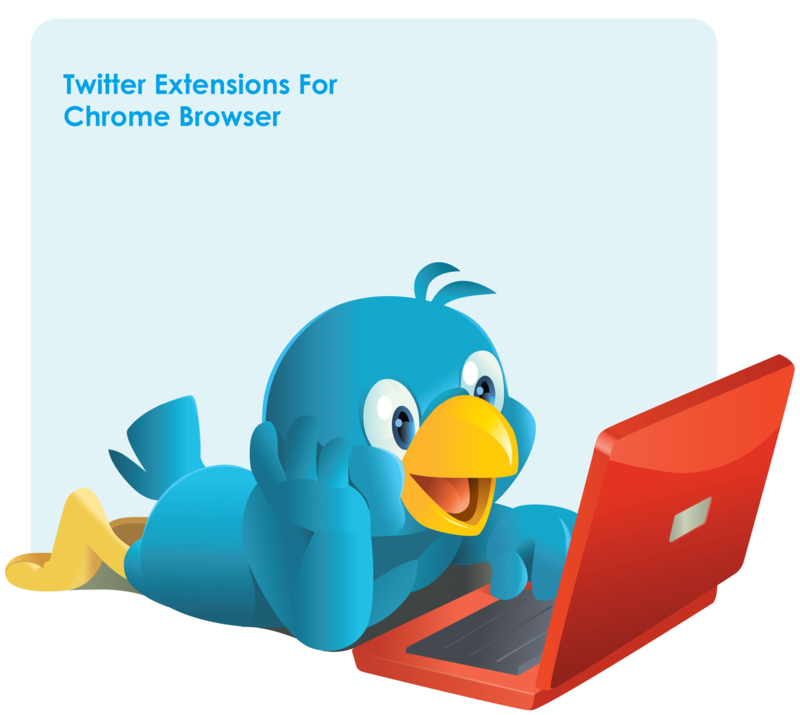 Here is a list six effective twitter extensions that you can install in Chrome. Chrome Bird is one of the extensions that adds and captures many features of twitter. Some of these include the ability to view and fall all of your tweets into a consolidated timeline. It also enhances direct navigation through direct messages and favorites among many other features. Shortened URLs can be created within Chromed Bird and previewed at any time for safety purposes prior to clicking on them, links to images can also be seen by simply hovering over them. If you want to compose new tweets or make replies, this can be done without leaving the extension’s convenient pop out window. This is another good extension for chrome. It has almost all the features that Chrome Bird provides, only that it makes it a lot easier to organise your tweets. The extension does this by providing many tabs, it has a tab for mentions, another for BM, favorites, timeline and so on. This thus makes it easy to quickly identify the tweets that you are looking for. This extension despite being free can enable you to see your timeline, post new tweets, make replies, shorten URLs, view geo-tagged tweets in Google maps and preview images. It is an extension which is simple and effective to use. Yoono is an amazing Chrome plugin. It can not only let you access Twitter, but you can also access other social media websites such as YouTube, LinkedIn, Facebook, Myspace and Flickr. Yoono enables you to keep track of all your social networking activity from one extension. If you use the social media as a way to generate traffic to your site, then this is definitely a useful tool to look into. Yoono will enable you to share information about your brand on different platforms all at the same time. This is an extensions that aims to enhance Twitter’s functionality by introducing several new features. Direct messaging for instance becomes very easy with Twitter extender. Direct messaging allows you to easily reply to all participants in a tweet by clicking the ‘reply to all’ button. Those familiar with the old Retweeting method (RT), will be happy to know that extender brings back this function. The extension also allows you to highlight mentions in the timeline and to change the tweet alignment. Extender also offers a URL shorten option as well as the ability to read right to left tweets, such as those written in Arabic. This is a Google Chrome extension that displays the 10 URLs that have been retweeted the most from websites that you are currently following. These 10 URLs can be filtered by retweet time intervals. You can specify these durations to include the past day, week, month or all time. Pulse is an important add in that enables you to see what the latest Twitter buzz is on your favorite websites with just the click of a button. If you who have a website, then you can use this information to generate content around these URLs. Such an action will help you attract more visitors since you are focusing on something that is of interest to them. The twitter app is a useful extension that shows the number of unread messages in your twitter account. It helps you keep track of useful tweets by giving you notifications on your toolbar. These notifications are displayed on the far right hand side of your browser’s main toolbar. Clicking on the extension’s accompanying icon brings you to your Twitter profile page. The extension then automatically resets the notifications number back to zero. If you are looking for an add-on that is simple and easy to use, then the Notifier will be a good start for you. Author Bio: Bernard Naylor is an Online Manager for CJ Pony Parts – one of the Top Mustang parts and accessories retailers in the world.He also likes blogging about online strategies that are related to SEO, Content, PPC & Lead generation. Oooh, love Tweetings, it kind of organizes everything. I have it attached to my torch browser now, and it kind of cleans up the mess that constant twitter users (like myself) make.